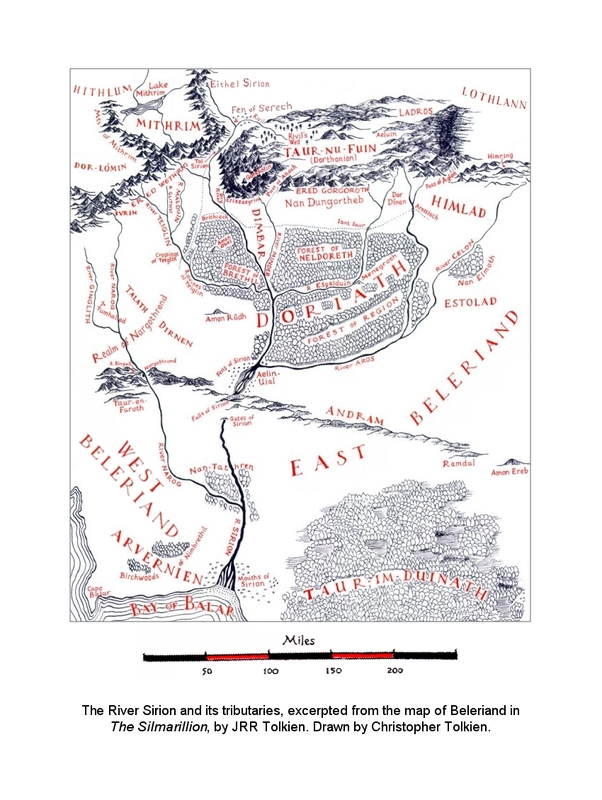 Location: The major river of Beleriand, flowing from Eithel Sirion in the north to the Bay of Balar in the south; the boundary between West and East Beleriand. The Sirion and its tributaries: Rivil, (unnamed), (Dry River), Mindeb, Teiglin, Esgalduin, Aros, and Narog. Beleriand lay on either side of the mighty river Sirion, renowned in song, which rose at Eithel Sirion and skirted the edge of Ard-galen ere he plunged through the pass, becoming ever fuller with the streams of the mountains. Thence he flowed south for one hundred and thirty leagues, 1 gathering the waters of many tributaries, until with a mighty flood he reached his many mouths and sandy delta in the Bay of Balar. In the south-west of Doriath, where Aros flowed into Sirion, lay great pools and marshes on either side of the river, which halted there in his course and strayed in many channels. That region was named Aelin-uial, the Twilight Meres, for they were wrapped in mists.... Now all the northern part of Beleriand sloped southward to this point and then for a while was plain, and the flood of Sirion was stayed. But south of Aelin-uial the land fell suddenly and steeply; and all the lower fields of Sirion were divided from the upper fields by this fall.... [Some] twenty-five leagues east of the gorge of Nargothrond Sirion fell from the north in a mighty fall below the Meres, and then he plunged suddenly underground into great tunnels that the weight of his falling waters delved; and he issued again three leagues southward with great noise and smoke through rocky arches at the foot of the hills which were called the Gates of Sirion. This dividing fall was named Andram, the Long Wall.... 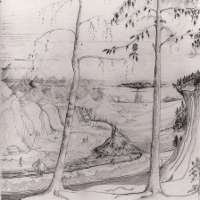 But south of the Andram, between Sirion and Gelion, was a wild land of tangled forest...; Taur-im-Duinath it was named, the Forest between the Rivers. And following Sirion from north to south there lay upon the right hand in West Beleriand the Forest of Brethil between Sirion and Teiglin, and then the realm of Nargothrond, between Teiglin and Narog. And the River Narog rose in the falls of Ivrin in the southern face of Dor-lómin, and flowed some eighty leagues ere he joined Sirion in Nan-tathren, the Land of Willows. South of Nan-tathren was a region of meads filled with many flowers, where few folk dwelt; and beyond lay the marshes and isles of reed about the mouths of Sirion, and the sands of his delta empty of all living things save birds of the sea. 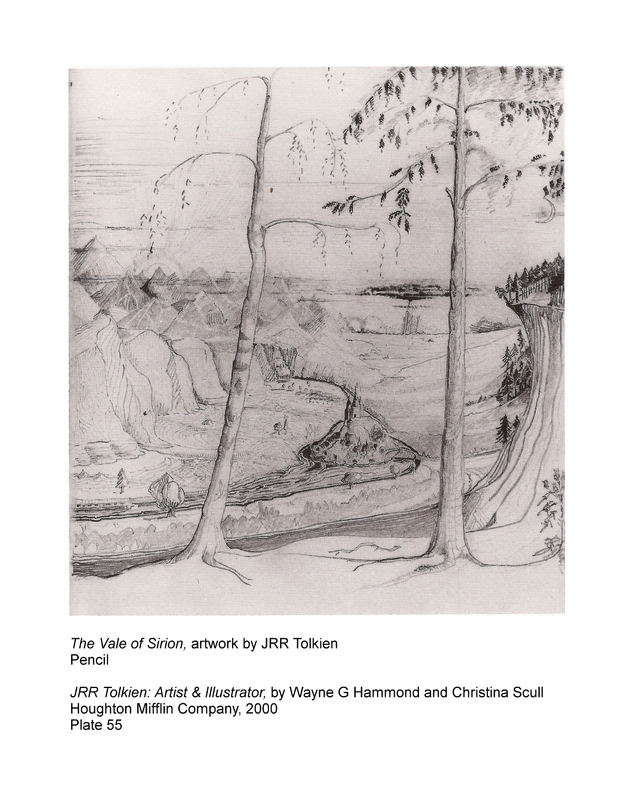 sîr 'river', from root sir- 'flow', in Ossiriand (the first element is from the stem of the numeral 'seven', Quenya otso, Sindarin odo), Sirion; also in Sirannon (the 'Gate-stream' of Moria) and Sirith ('a flowing', as tirith 'watching' from tir), a river in Gondor. 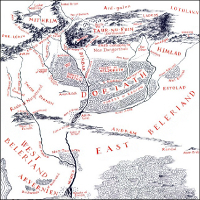 With change of s to h in the middle of words it is present in Minhiriath 'between the rivers', the region between the Brandywine and the Greyflood; in Nanduhirion 'vale of dim streams', the Dimrill Dale..., and in Ethir Anduin, the outflow or delta of Anduin (from et-sir).